This is the new icon of Singapore right here. Designed by Moshe Safdie, it is hotel, convention centre, and a casino. The best place to view this scene would be from across the bay at One Fullerton or (and here's a little tip for you) the top floor of newly-opened National Gallery. For views from an altitude, ride up to the rebranded resident MBS bar C'est La Vie for harbor and downtown view. This rooftop bar at Fullerton Bay Hotel is perenially packed, and for good reasons. The beautiful decors, the amazing pool right smack in the middle, and panoramic view of Singapore probably are some of the reasons why. Be sure to make your reservations a week in advance. 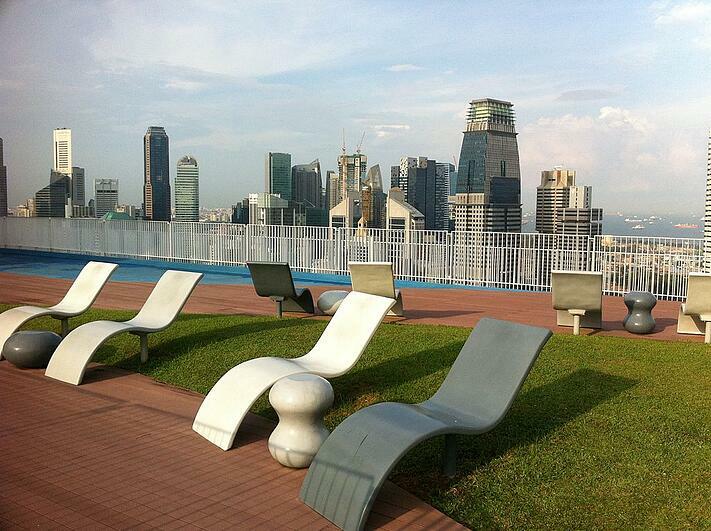 The Raffles Place location of this rooftop bar makes for an easy destination while you're in the center of the city. 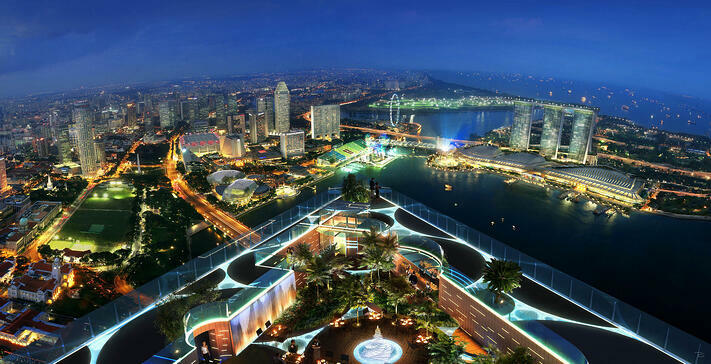 Your entrance pays for one drink at the top, plus a sweeping 360-degree view of downtown Singapore. Clarke Quay hosts numerous number of bars and restaurants and a place not to be missed if you're into nightlife scene here in Singapore. The Singapore river runs through Clarke Quay continuing to Boat Quay on the other side. In old times, Clarke Quay used to be mooring jetty for tongkangs and bumboats carrying goods upstream to its warehouses. Try out the reverse bungee if you dare! OK the picture doesn't exactly show night time view, but we can tell you it's gorgeous here at night. This is a little secret place that most travelers missed when they're looking for night view location in Singapore. The Pinnacle@Duxton is a government subsidized apartment housing complex in Outram Park. When you think about government housing, it is probably the pinnacle (pun-intended) of all HDBs (that's what government housing is called) in Singapore. The 7-building complex is joined by a pedestrian walkway at the 50th floor (hmm, notice a pattern here?) which is open to public for $5 only. Access it by tapping your EZ-link card at the machine located in the basement of Building G. View of downtown Tanjong Pagar awaits you. Bonus entry: This place would be a great location to hang out for great night view of Singapore, but unfortunately it only opens from 3-6 pm every day (enter by 5:30 pm). Head to ION Sky at 56th floor of the futuristic looking ION Mall located on Orchard Road, and soak in 360-view of the city. And what's so cool about it? It's FREE!